Mysteries of the Ages Revealed. The four seasons of the great year are marked by Egypt’s four minor sphinxes, Ezekiel’s four heads of the beast, Revelation’s four cherubim, and astronomy’s Taurus, Leo, Aquarius, and Scorpio (Abraham’s Eagle) constellations. (Cross takes 25,800 years to make one turn through the twelve ages) . Our astrological birth signs no longer coincide with the sun’s location in the constellations of the Zodiac because of precession. Even the Tropic of Cancer and the Tropic of Capricorn are now the Tropic of Taurus and the Tropic of Scorpio when we observe the sun on the solstices? Our astrologers and map makers neglected to update our present position in the cosmos for over 2,000 years. We are not the astrological birth signs the newspapers and a majority of the astrologers proclaim we are! The North star (pole star) also changes with the precession of the equinoxes. The North star was Thuban (Alpha Draconis) when the Great Pyramid was constructed to align with true North. The descending passage of the Great Pyramid points to Thuban, the most accurately aligned pole star of all the North stars in the 25,800-year cycle of our Earth. Comprehend that the word sphinx means to bind or close a circle tightly, and that the Great Sphinx binds Virgo and Leo in the Zodiac on the ceiling of the Portico — at Esna’s Khnum Temple. 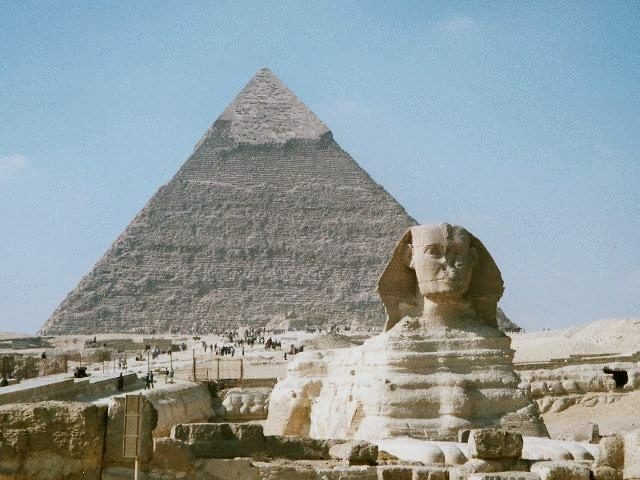 The Great Sphinx marks the “Happy New Year” of our present Platonic year, and Leo was the first age in this great year. Listen when the Vatican informs us every Christmas Eve, when it reads the ancient Calens (calendar) from Rome, that it was the sixth age or the Piscean Age when Jesus, the fisherman, was born 2,000 years ago. Even the ancient Persians called Polaris the “turning point star” 5,000 years before it became our current pole star between the sixth and seventh ages. horns in the temples. By looking at the Master Calendar, the Mazzaroth, or the Zodiac in the heavens, anyone could see that it was the dawning of the Age of Aries the ram or lamb. It was the start of the fifth age in our current great year. At one time in history, the Vernal Equinox used to indicate New Year’s Day in our annual calendar until Julius Caesar moved it to January 1 in 45 BC. The names of our months still reflect March as the first month of the year. In Latin, Septem is seven, Octo is eight, Novem is nine, and Decem is ten. This is why the name of an age is determined by where the sun is on the Vernal Equinox. The megalithic monuments like Stonehenge, Chichen Itza, and Casa Grande are all trying to find the Vernal Equinox or the first day of spring in the Northern Hemisphere. Understand how Nostradamus, Revelation writers, and the Mayans could have used this 25,800-year cycle of our planet to predict what can be expected as we approach what some call the millennium. The ancients refer to the coupled-ages of Pisces (Fish) and Aquarius (Man) in the great year as the time for the FisherMan (Jesus) or Merman (Fish-Man) to return from the sea. The old legends say that he will teach the people how to heal and govern themselves. Don’t be confused by the misinformed people on the planet. Our scientists inform us that, in the great year, we are dawning into the Age of Aquarius and leaving the Piscean Age. When someone says, its the dawning of the Age of Aquarius, that is no different then someone saying, it is the beginning of the month of July. Only, ages are around 2,150 years long, while months are made up of approximately 30 days. Many college books inform us that we are commencing a new age in the great year. Even Pat Robertson, who throws oranges across the media-air waves at the new age people, wrote a book called The End of the Age. He should realize — if we are eternal as he preaches and it is the end of an age, than it must be the beginning of a new age. Itself: I am everything! I am God! I am It! I am the point or a perfect circle! God I am bored! I am so tired of playing with Myself. This is ridiculous. I am tired of being all one or alone. Notice that “all one” and “alone” are essentially the same word. If one is all one, then one must be alone. Are we sensing the predicament of the One Who Causes? Being absolutely bored, the Oneness comes up with a bright idea. Why! I’ll just split into two. This would be the same way we split into two teams to play football, chess, or checkers. The Perfect Circle, God, or the Whole gets imaginative, and It splits in two or in-to creation. Once the Oneness or God splits into the two U’s (You & You, Us or We), what is a game the universe can play? “Hide and Seek” of course! God can hide from Itself, and spend Its Being trying to find Itself. Give me space to find myself! I have been found! I found it! Most of us know that lost and found departments are normally found together. The game of the universe is hide and seek. Dis-member to separate. Re-member is to put it back together again or to remember something we have forgotten. Every baby knows this intuitively, until we teach it to babble in words. in full manifestation. The more we separate them the more lost we become. At this juncture in the great year, we are using less than twelve percent of our brain’s potential, and we are only putting one fish on the car bumper. How lost we are! The coming of Aquarius, the man or water bearer, gives us two lines that fit back together. We are approaching a time of Atonement (at-one-ment). It is time for us to re-member or awaken. It is time to look down and observe that our right and left hands are connected. Notice that the electric light doesn’t work without the plus and minus. The end of the Piscean Age is a time of Revelations. It is time to reveal the truth. Catch the Joke! — It was necessary to get lost just to play. Secrets of the Sphinx is a revealing book that is subtitled The Mysteries of the Ages Revealed. It will point out that it is not the end of the world, but we can expect some very big seasonal changes — the same as the frost comes and the leaves change colors shortly after the beginning of fall. It will teach you what types of foods will help you stay healthy, look younger, and handle the sun’s increasing light at this juncture in the great year. Secrets of the Sphinx is an uplifting experience and an easy book to read. You will be thinking about this publication long after you set it down! Copyright material-Secrets of the Sphinx©. You may use it for personal use only.